Pets can come from many places: breeders, pet stores, shelters, friends, or classified ads. Where did you buy/get your pet? I bought Spud and Sugar from a breeder. Be sure to comment with your answer! I have two basset hounds named Spud and Sugar. Basset hounds originated in France and were originally bred to hunt rabbits. 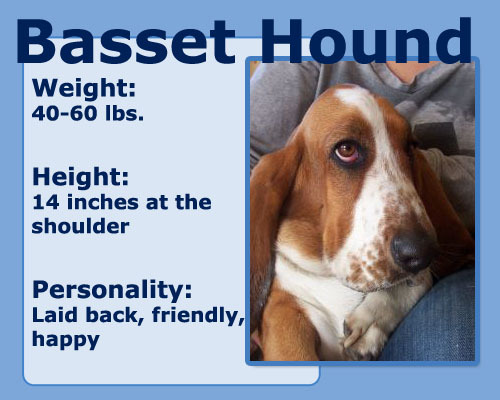 The basset hound is a member of the Hound Group and weighs between 40 and 60 lbs. In French, “basset” literally means “low”, and basset hounds certainly live up to their name, being just 14 inches tall at the shoulders. Basset hounds tend to be laid-back, friendly, and happy dogs. They are very loyal and enjoy the company of their person/people. Basset hounds almost always get along well with other dogs. Basset hounds can be nice to small pets and cats as long as the basset was not trained to hunt–if they have, they may chase cats or small pets. Still, don’t leave your basset hound alone with pet rabbits or rodents, as the basset hound could accidently hurt the pet while trying to make friends with it. Basset hounds can have back problems because they are so long. They are also prone to obesity, intervertebral disc disease, OCD, vWD, foreleg lameness, entropion, gastric torsion, ectropion, otitis externa, glaucoma, and CTP. Basset hounds usually live between 8 and 12 years, but this depends greatly on their health and diet. This is Sugar and she is our 6 year old basset hound! A few years after the death of our previous basset hound, named Potato, we were ready for a new one. 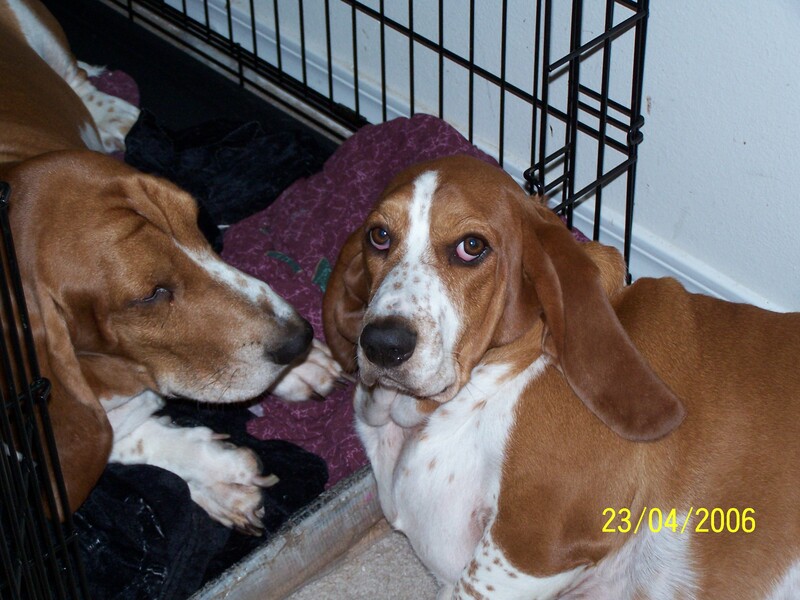 So, we contacted some breeders and they emailed us some pictures of their basset hound puppies. We fell in love with Sugar, and her half brother Spud. Sugar is very affectionate and people-oriented. This is one of my two dogs, Spud. We got him from a breeder in January 2004. What happened was he was the last puppy in his litter left, and he looked like our deceased basset hound Potato. So, we named this one a similar name and raised him along with his half sister, Sugar!